After more than a month of planning, the day finally came for me to begin the quest for those all-important 500 kilometres between today and New Year's Eve, to attain the challenge. Even though I have done various cycle tours over the years I still felt quite nervous about this one. 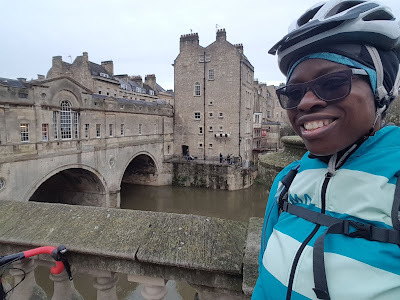 It was probably a combination of starting the ride somewhere far from home, that I was not familiar with, a weather forecast that didn't look great, not knowing what the state of the trails would be like, and also using new equipment. I had a new bike to test - a Cube Nuroad WS women's gravel bike, new lights for off-road biking, and a new portable hydration pack - none of which I'd had the chance to rehearse with. 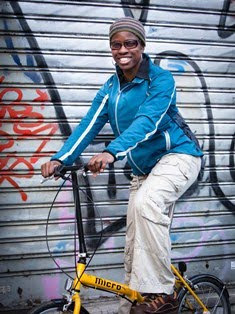 I wasn't altogether happy with some of my old equipment, notably my mountain biking shoes. They were in a pretty damp and muddy state after having spent the two previous days in back-to-back mudfests (also known as cyclocross races!) particularly after yesterday's soggy conditions at the Mendips Raceway. This year's theme for my Festive 500 is rail trails. I will ride as many of these converted disused railway lines as is practical. 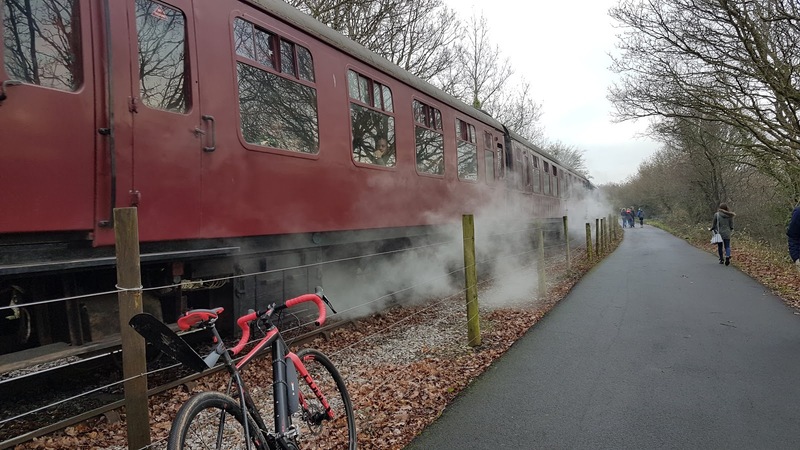 Today's ride started from the village of Easton-in-Gordano just outside Bristol, and went out to Portishead, then back to Bristol via the Ashton Court Estate, and onwards to Bath via the Bristol-Bath rail trail. From Easton-in-Gordano I found an off-road path known as the Sheepway, part of the Avon Cycleway network and that took me straight to Portishead. The trail was a mixture of gravel and compacted earth. It was slightly muddy, but nothing excessive. Although I was quite near the coast I wouldn't have known it because there were various industrial parks nearby blocking the view. However, the sound of seagulls couldn't be concealed. Portishead town centre looked pretty, though being Christmas Eve the high street was very busy. Somehow, because I had been thinking so much about doing rail trails I hadn't thought much about cycling up hills anywhere. In fact, I ended up doing a pretty big climb on the run back into Bristol - 2km up Naish Hill. It was pretty steep, and quite unexpected. As I struggled up it, a club rider flying past in the opposite direction shouted "Keep going" across to me. I was grateful for the encouragement as I was only half-way up at that point! After that, it was then a rolling road to get to the Ashton Court Estate, where I got onto an off-road trail to reach Clifton Bridge. I do like this bridge. It's quite picturesque, as far as suspension bridges go, and judging by the number of people hanging around there it seemed like more than just a bridge, as there was a visitor centre, as well as the nearby Leigh Woods and Ashton Court Estate, making it a pleasant day out. Ashton Court Estate is also popular with mountain bikers where there are a few technical trails plus a novice trail to try out too. Once in central Bristol I did a lot of stop-starting to find my way to the Bristol-Bath cycle path, and that probably cost me a bit of time - not really what I want when trying to get in the miles. Eventually I found the path, which started from the St Philip's area of the city. I've gotta say it wasn't the prettiest of venues to start the trail, and I hoped things would look nicer as the ride progressed. Thankfully, once past the rough urban streets I was again back into Bristolian leafy suburbia. This rail trail is the former Midland Railway Bath to Mangotsfield line, which was axed along with loads of other trails around the country, following the Beeching Report in the 1960s. Nowadays it is a very popular path with walkers and cyclists. The whole 15-mile route between Bristol and Bath is tarmacked so you can ride it quite quickly when there's no one around. The remains of Warmley station, with it's platform are still there and the old building is now a mini cafe with toilets. There is also a cafe further along, at Bitton. Along the way, I saw a few leisure cyclists, and a lot of club cyclists on training rides. One person I spotted was someone in Team Sunweb kit who was particularly going for it. Initially I thought it was someone in replica kit, but something about their lean frame and concentrated look made me think it must be an elite cyclist. It was only after I passed the rider that I realised it was Pfeiffer Georgi - previously in Team Jadan-Weldtite, now part of Team Sunweb. The last time I saw her was when she won the Queen of the Mountains at Stage 1 of the Tour de Yorkshire earlier this year. If only I had had my wits about me to talk to her today. Mind you, I'm not sure if she would have wanted to stop given that she was in full flow! The rest of this trail has other attractions, like sculptures, the Avon Valley Railway, on which a vintage train passed through while I was there. 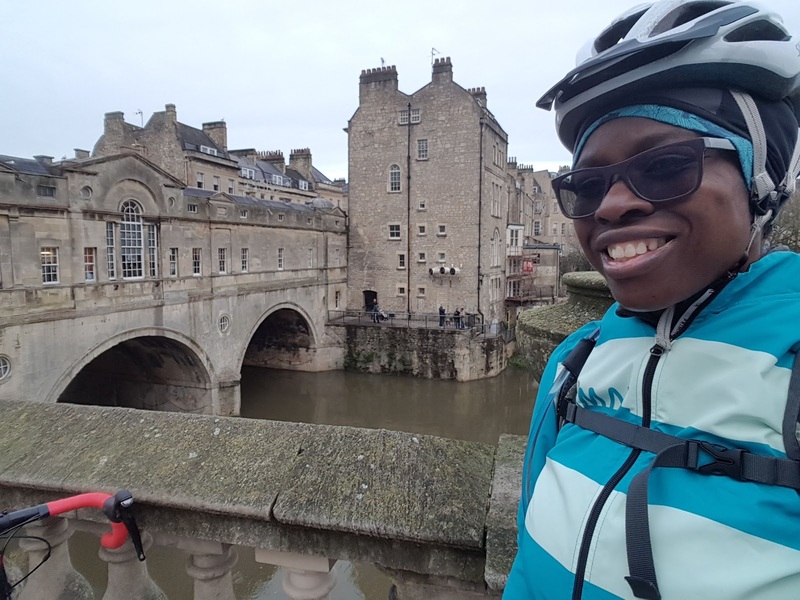 For other off-road rides there's the River Avon Trail, the Avon Cycleway and the Kennet and Avon Canal Towpath. These attractions definitely give me a reason to come back here in future. As things were though, I had to push on to Bath, where the end of the trail was definitely prettier than the start. All that regency architecture definitely makes the city appealing, and it was heaving with shoppers and tourists alike. I had just enough time to do a quick spin around the city centre before getting the train back to Bristol Temple Meads and do the 10-mile route back to Easton-in-Gordano. By the time I reached Bristol it was 4pm, and getting dark. In fact, night fell while I was on the River Avon Trail en route to Pill. Thankfully I was able to use my mountain bike lights. I had a Lezyne Macro Drive Duo 700 helmet light, and a USE Exposure Race Mk13 light for the bike. The Lezyne alone was enough for these conditions. To be honest, as there were a few hardy souls out running along these trails I felt it would've been inconsiderate to dazzle them with both of my lights. The Lezyne was enough of an annoyance for them! The River Avon Trail is not a rail trail but it is a popular off-road cycle route. 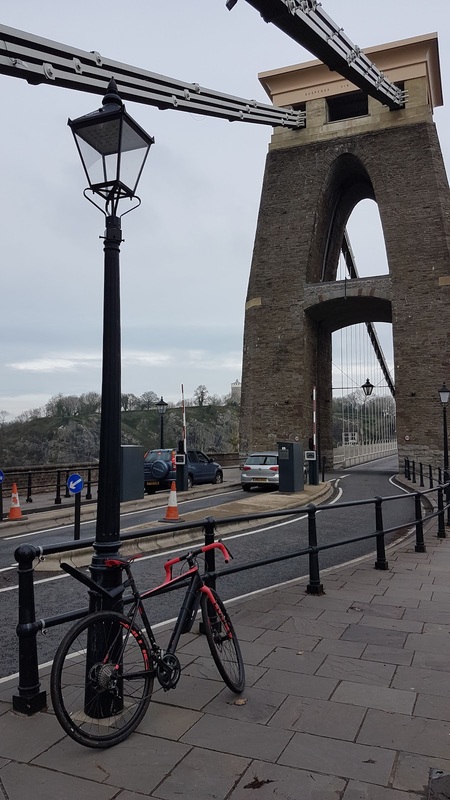 You go along the River Avon gorge and for a long section of the ride there is a great view of the Clifton Suspension Bridge above, as spectacular rocky outcrops tower over you. You'd almost forget you were in a city if it wasn't for the fast Portway road on the other side of the river. 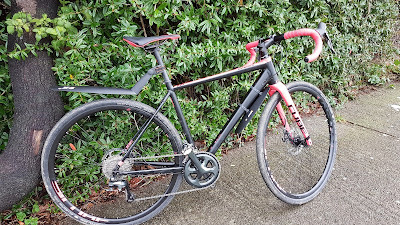 Given all the rain from previous days the trail was quite muddy in parts, but the Cube Nuroad coped well. I was very glad to have put mud-guards on the bike. I was completely dry at the end of what ended up being a pretty messy end to my day. The bike will need a bit of a clean-up before I set off again tomorrow, but I don't mind. Considering how apprehensive I was feeling beforehand, if a muddy bike at the end of my day is the biggest hardship I can't complain. It was a good first day! Wanna do the Festive 500?